The gravitational waves were detected on Sept. 14, 2015, at 5:51 a.m. Eastern Daylight Time (9:51 UTC) by both of the twin Laser Interferometer Gravitational-wave Observatory (LIGO) detectors, located in Livingston, Louisiana, and Hanford, Washington, USA. The LIGO Observatories are funded by the National Science Foundation (NSF), and were conceived, built, and are operated by Caltech and MIT. The discovery, accepted for publication in the journal Physical Review Letters, was made by the LIGO Scientific Collaboration (which includes the GEO Collaboration and the Australian Consortium for Interferometric Gravitational Astronomy) and the Virgo Collaboration using data from the two LIGO detectors. 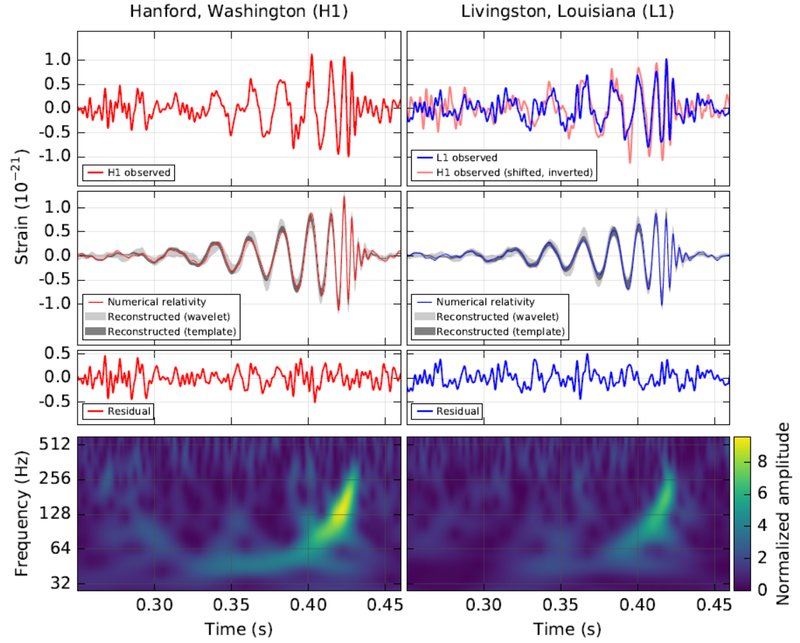 On Sept. 14, the LIGO Hanford, Wash., and Livingston, La, observatories detected the coincident signal referred to as GW150914. It was just past 4:50 a.m. in Livingston and just past 2:50 a.m. in Hanford. The signal arrived at Livingston about seven-thousandths of a second (0.007 seconds) before it reached Hanford. The signal was discovered by the real-time search program Coherent WaveBurst, which identifies gravitational wave signals in the LIGO data. The coincident detection was reported by Coherent WaveBurst within three minutes of the signal arrival. Coherent WaveBurst reconstructed the signal shape revealing a spectacular signature of two colliding black holes. In a fraction of a second they merged into a single more massive black hole releasing energy equivalent to a few times the mass of our Sun in a burst of gravitational waves. Coherent WaveBurst, was developed at the University of Florida by physics professors Sergey Klimenko and Guenakh Mitselmakher, and their graduate students and postdoctoral research associates. Klimenko and Mitselmakher have been leaders in LIGO’s search for gravitational-wave bursts since 1997. The burst search seeks to detect short gravitational-wave signals from supernovae, gamma-ray bursts, mergers of binary neutron stars and black holes, and other catastrophic astrophysical events. Coherent WaveBurst conducts a search for signals with poorly known or unexpected shapes, making no assumptions about the form of the gravitational wave signal. The search algorithm, which has been used in LIGO since 2004, was invented and developed at UF. LIGO data analysis is a big part of Florida’s gravitational wave portfolio. UF physics professor Bernard Whiting has been active in the search for stochastic gravitational waves, relic gravitational waves produced a tiny fraction of a second after the formation of the universe in the big bang. The University of Florida has been involved with LIGO since its inception. That involvement began with an email message sent in October 1995 to the physics faculty by Mitselmakher, who had just joined the Physics Department as a senior professor. The message was about research opportunities in LIGO and was motivated by Mitselmakher’s knowledge of the LIGO project from his work with Barry Barish (then LIGO Laboratory Director) in high energy physics. A number of faculty responded. The initial group of active participants consisted of Mitselmakher, Whiting, and physics professors David Reitze and David Tanner. Shortly after this beginning, two other current faculty members joined the UF LIGO group: Klimenko in 1997 and Guido Mueller in 1998. Florida’s interest was well timed, as the LIGO Laboratory, the consortium managed by Caltech and MIT, was just beginning to design the initial LIGO detector. There were a number of meetings, conferences and lab visits between UF scientists and LIGO scientists. A critical meeting took place in February 1996, when Mitselmakher, Reitze, Tanner and Whiting visited the LIGO laboratory to discuss whether and how UF could contribute to the initial LIGO detectors, then beginning their construction. The outcome of this discussion was that the University of Florida took responsibility for the Input Optics (IO) of LIGO, one of the most complex and diverse systems in the entire interferometer. In doing so, Florida was the first institution outside the original Caltech-MIT collaboration to have an essential role in LIGO. The input optics system is composed of all the components between the high power laser and the LIGO interferometer itself. It provides laser modulation needed for the controls, a mode cleaner to improve the quality of the beam, a Faraday isolator to prevent reflected light from returning to the laser, beam expansion and mode matching so that the laser light fills the main interferometer, laser power control, and a number of other functions. Beginning in the fall of 1996 and continuing to today, Florida has designed, built, delivered and installed the input optics for the three interferometers in initial LIGO (completed 2001), upgrades to two of these for Enhanced LIGO (2007–2009), and for the three interferometers (with one, intended for LIGO-India, in storage) of Advanced LIGO (2011–2014). Reitze was the initial leader of the IO team; Guido Mueller took over in 2011. The Florida-supplied input optics of Advanced LIGO was designed, built, delivered, installed, and commissioned at both LIGO locations during 2012 to 2014. In parallel, other LIGO teams followed similar steps to make the laser, prepare the vacuum system and construct seismic isolation systems, the multi-pendulum mirror suspensions, photodetectors, control electronics, data acquisition systems and analysis software. A simplified diagram of the detector is in the image below. Simplified diagram of the Advanced LIGO detector. The instrument is essentially an ultrasensitive laser rangefinder, measuring the difference in lengths of two 4-km optical cavities formed by mirror surfaces on the test masses in horizontal (x) and vertical (y) arms. An incident gravitational wave will have the effect of lengthening one 4-km arm and shortening the other during one half-cycle of the wave; these length changes are reversed during the other half-cycle. The output photodetector records these differential cavity length variations. Inset a: Location and orientation of the LIGO detectors at Hanford, WA (H1) and Livingston, LA (L1). Inset b: Instrumental noise versus the frequency of the wave. The detectors are most sensitive around 190 Hz (G below middle C). UF is proud to have worked with many outstanding scientists at other universities to have brought LIGO to the sensitivity to make this detection. The list in the US is long and includes Louisiana State University, UF, Georgia Tech, the University of Mississippi, Fullerton, Columbia, Stanford, Oregon, Maryland, Michigan, Carleton, Minnesota, Texas Rio Grande, Penn State, American, Hobart & William Smith, Syracuse, University of Wisconsin Milwaukee, MIT, and Caltech. The Advanced LIGO detectors construction was finished and accepted by the National Science Foundation in late 2014. An official dedication took place at Hanford in May 2015, transitioning the facilities from a construction project to functioning observatories. By August 2015, the two detectors were working well, only a bit short of their designed sensitivity (as is normal at the early stage of such a complex project). The diagram above contains a graph of LIGO’s sensitivity as a function of the frequency of the wave. The frequencies to which LIGO is sensitive are in the audio frequency range, 30 Hz to 4000 Hz, or B0 (third piano key from the bottom) to B8 (second from top). An “engineering run” began in late August. The goal was to operate the interferometers in a mode where scientists responsible for commissioning the detectors could study their performance and, if necessary, make small changes to procedures and operating conditions. A full “science run” called O1 for Observing Run One was planned to begin in late September. The LSC collaboration was confident in detector performance and hopeful that the long-stated goal of the collaboration, to detect gravitational waves, would be reached in the next few years. On Sept. 14, everything changed. Even though the detectors were being operated in engineering rather than science mode, data were being recorded and an online analysis program (Coherent WaveBurst, as described above) was operating. Two black holes, orbiting each other more than 20 times per second, emitted an oscillating force field that shook the mirrors by a tiny amount. The shaking was detected because of the sensitivity of the LIGO detectors. (They can detect mirror motions that are 10,000 times less than the diameter of a proton.) The signal shows the two black holes spiraling into each other, moving faster and faster, reaching more than 100 orbits per second. Then, they merged, forming a single, heavier, rapidly spinning black hole, ringing down to invisibility. GW150914 (filtered with a 35–350 Hz band-pass filter) as observed by the LIGO Hanford (left) and Livingston (right) detectors. GW150914 arrived first at Livingston and about 0.007 second later at Hanford. Second row: Calculation by Einstein’s theory of general relativity of the strain from the inspiral and coalescence of two black holes with mases 29 and 36 times the mass of our Sun. Third row: Background noise. Bottom row: A time-frequency representation of the strain data, showing the signal frequency increasing over time. The total duration of the event was about 0.12 seconds. This discovery provides the capstone to Einstein’s general theory of relativity. General relativity is a geometric theory of gravitation, expanding and extending Newton’s theory of gravity. We know gravity as the force that attracts us to the ground under us, causes oranges to fall from the tree, and keeps the Earth and other planets in orbits around the Sun. Einstein’s theory replaces Newton’s forces with the notion that gravity is the result of the bending or warping of space-time. The equations of general relativity were first described (to the Prussian Academy of Sciences) by Einstein in November 1915. General relativity makes a number of predictions and most have been confirmed since the theory was published. These include the precession of the orbit of Mercury, gravitational lensing, supermassive black holes, and the warping of time, now an important correction built into global positioning systems. That the theory predicted the emission of gravitational waves by objects orbiting each other was proposed by Einstein in June 1916. The paper was in German, “Näherungsweise Integration der Feldgleichungen der Gravitation,” or “Approximate integration of the field equations of gravitation.” These waves have been invoked to explain the dynamics of a pulsar in orbit around another star but direct observation of them had up to now eluded physicists. With the observation and the publication of the paper, just under 100 years elapsed between the beginning of the theory and the first capture of gravitational waves. It also is the first time two black holes have been seen in orbit around each other. This result will literally change the way we look at the universe. National Science Foundation support for the Florida LIGO group began in 1997 and has continued since then. The NSF has supported both instrument science and data analysis research. Mueller, Reitze, Tanner along with students and postdoctoral research associates have carried out a variety of research projects on instrument configurations, devices for the IO, and other experiments aimed at future detectors. 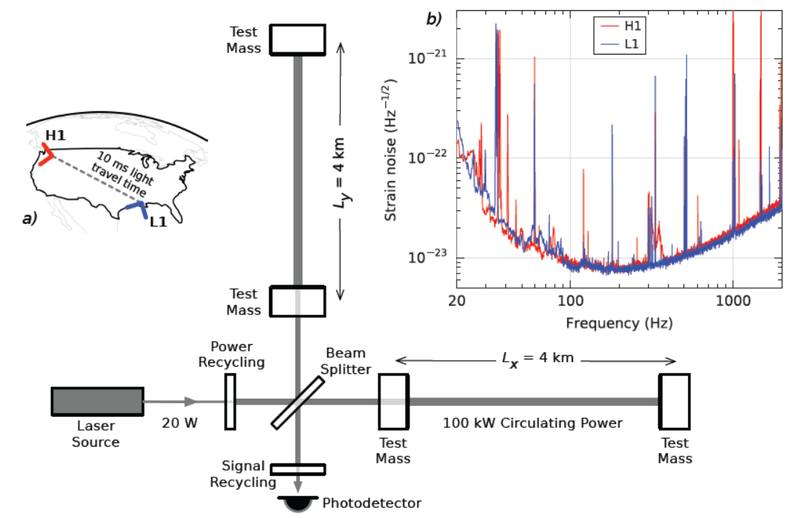 An important contribution was a breakthrough design of the recycling cavities of the interferometer by Mueller and postdoctoral research associate Muzammil Arian. Called “stable recycling cavities,” this approach improved the quality of the optical beam in the interferometer and reduced sensitivity to mirror surface errors and environmental disturbances. Similarly Klimenko, Mitselmakher and Whiting with students and postdoctoral research associates developed methods for data analysis and gravitational-wave detection. The Florida group has grown over the years. Stephen Eikenberry joined in 2011 and is leading a group working on using astronomical telescopes—including the University of Florida’s Gran Telescopio Canarias—to identify and study light from the astrophysical sources generating the LIGO signals. Hai-Ping Cheng joined in 2012 and studies the reasons for the observed excess noise in the optical coatings of the LIGO mirrors. From an initial size of about eight (four faculty, two postdoctoral research associates and two graduate students) in 1997, the UF LIGO group currently has about 20 members, including faculty (six), postdoctoral research associates (three), graduate students (six), and undergraduate students (five). University of Florida faculty have also played important roles in the leadership of the LIGO experiment and of the LIGO Scientific Collaboration, a group of more than 900 scientists worldwide who have joined together in the search for gravitational waves using LIGO data. Reitze was chair of the Optics Working Group from 2001 to 2007. Mueller was chair of the Lasers and Auxiliary Systems working group from 2011 to 2013. Klimenko has been chair of the LSC Presentation and Publication committee since 2011. Tanner has been chair of the LSC Elections and Membership Committee since 2011. Reitze was elected to the position of Spokesperson of the LSC in 2007 and to a second two year term in 2009. In 2011 he was appointed director of the LIGO Laboratory and holds that position now, while on leave from Florida. Whiting and Mueller operate an international undergraduate student exchange for the LSC.